As I mentioned earlier, this afternoon we made a couple crafts and had a (tea-less) Tea in Honor of Our Lady of Altagracia, inspired by yet another one of Alice's amazing Liturgical Teas. This one is is based on the Novena prayer to Our Lady of Altagracia, which was translated by Helen from the original Spanish! Oh, Dearest Mother, Sweetest Virgin of Altagracia, our Patroness. favors that we have received from your hands. learn from the example of your holy life. 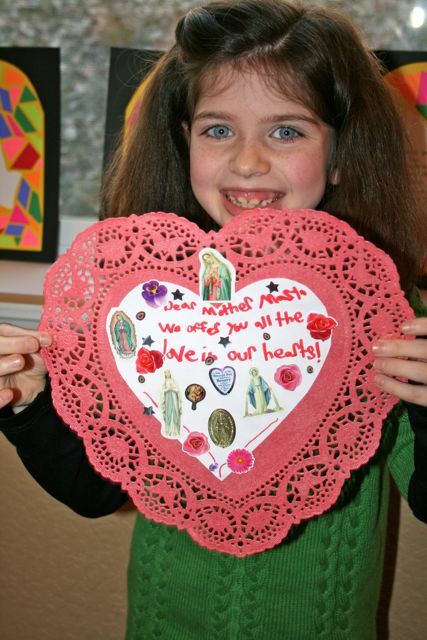 You are our Mother, and like children, we come to offer you all of the love of our hearts. 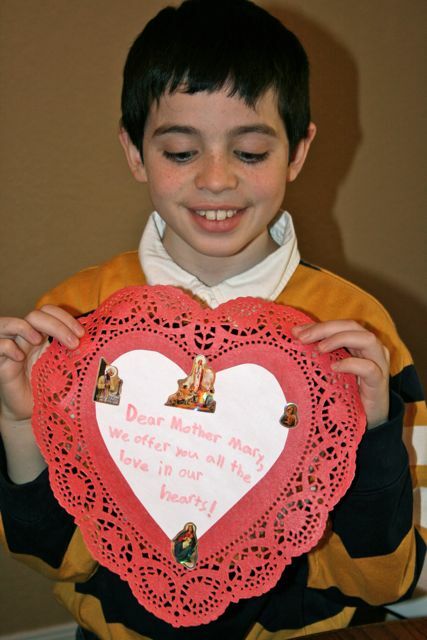 Receive, dearest Mother, our offerings and listen attentively to our supplications. Amen. 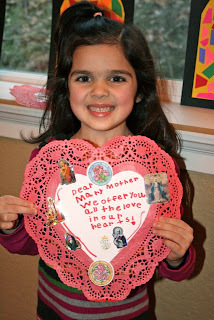 For this activity, the children all created "love notes" to our dear Mother Mary. 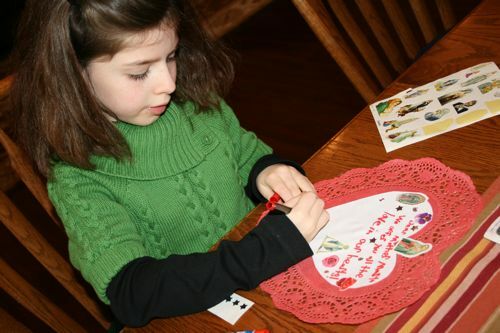 I gave them each a large red heart shaped doily (I picked up a pack of 16 from the Dollar Store), a smaller white heart cut out of copy paper, and a pile of stickers. 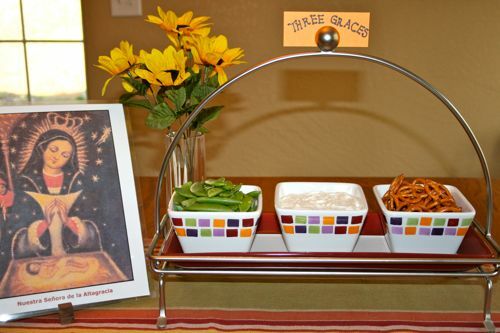 "The Novena specifies the three graces we request from Our Lady, and the menu offerings of the tea reflect them in a simple way." 1. Love of Purity ~ White ranch dip represents purity and will go well with the vegetables in the next menu offering. This reminds us of the perfect purity of the Holy Family. 2. Home Blessing ~ This next offering reminds us of the humble home of the Holy Family in Nazareth, and we ask for a shower of blessings upon our homes, making them flourish in the holiness of matrimony. 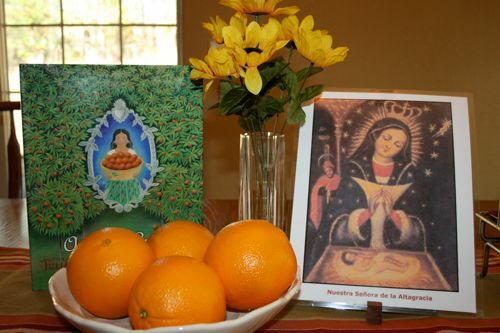 Since Our Lady of Altagracia is patroness of the Dominican Republic, Alice suggests "we remember "Home Blessings" with produce that grows in this, her chosen homeland: snap peas or pea pods. When you break open the side of the pod, the peas inside look like a family in their house. " 3. Maternal Arms ~ In the last supplication we ask for the grace of flying to Heaven with the help of Our Lady's maternal arms. For this offering Alice suggests serving small twisted pretzels. 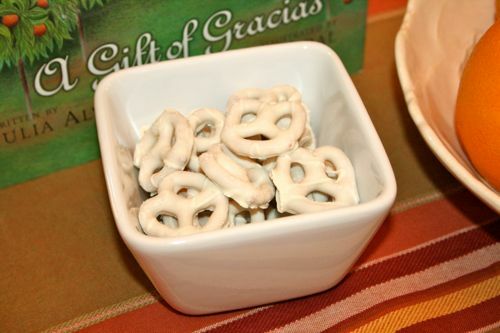 She says, "The original German pretzels were meant to represent arms crossed in prayer, but I think they would make a wonderful maternal embrace for these purposes"
I also served a bowl of White (Our Lady's Purity) Pretzels (Maternal Arms). 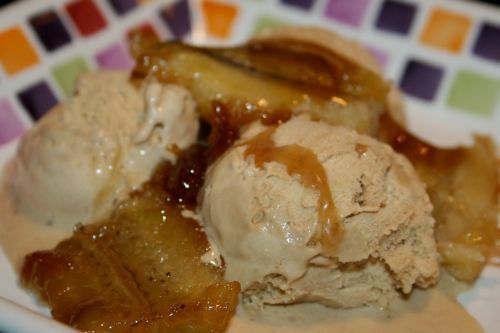 For a delicious dessert in honor of Our Lady of Altagracia, Alice suggests serving caramelized bananas over coffee ice cream since the chief exports of the Dominican Republic are coffee, sugar and bananas. Directions: To carmelize the bananas, preheat the oven to 450 degrees. Slice the bananas in half and sprinkle with butter and brown sugar. Bake about 7 minutes or so. If this is too difficult, use plain ripe bananas over coffee ice cream--or even vanilla ice cream with bananas and a drizzle of coffee syrup. 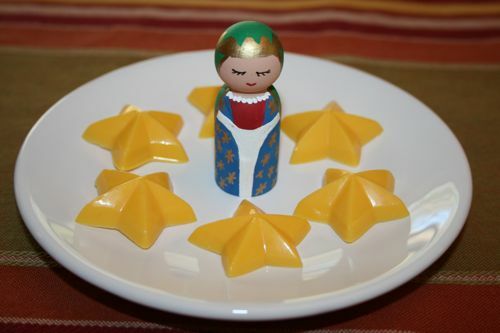 The next treat I made was a crown of stars for the "beautiful lady with golden skin and a crown of stars." ~ excerpt from A Gift of Gracias: The Legend of Altagracia I placed our little hand painted Our Lady of Altagracia doll in the center. Melt and mold Yellow Chocolate according to directions using a star chocolate mold . 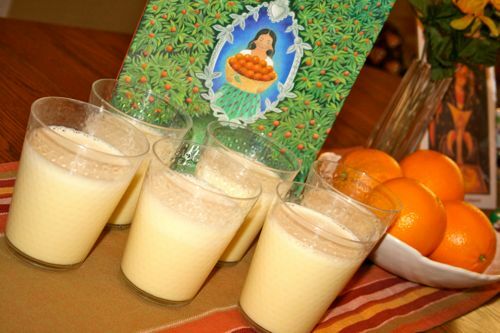 You can find the recipe from this delicious drink at Catholic Cuisine. 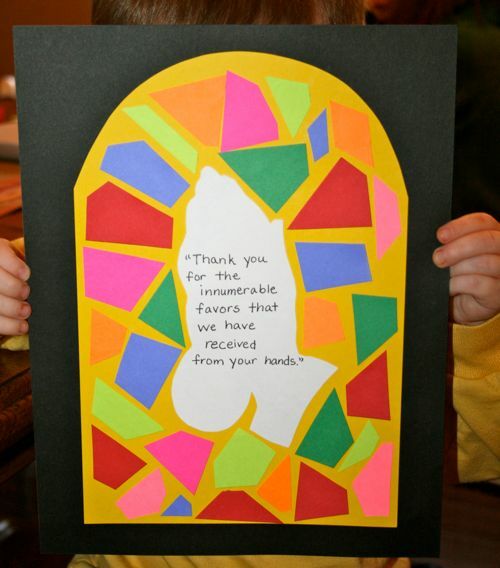 to God with a hymn of thanksgiving for all the benefits you have distributed. 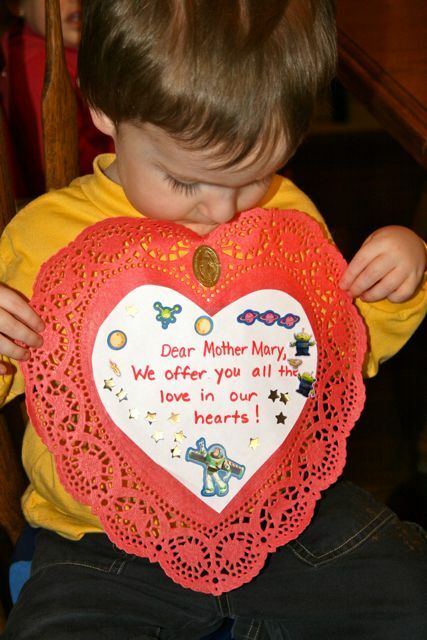 We promise you, Oh Mother, gratitude and fidelity. well done. I'll file this in my mental archives for later. carmelized bananas are one of me all time favorites. I never thought od doing them in the oven though. I like that idea as it requires a little less nurturing than the way I do it in a skillet. I also never thought of paiting it with one of my favorite ice cream flavors - coffee. yum yum!!! This was lovely. The children have been asking me when our next tea would be and this would have been perfect. Inspired once again by your sharing. Everything looks so yummy! 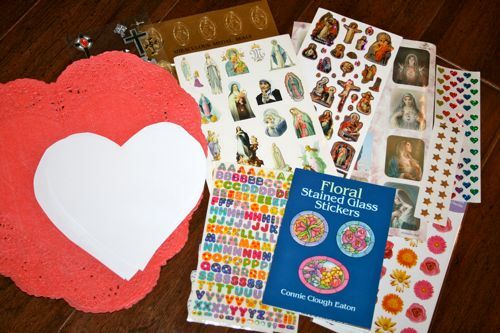 Where do you get your religious stickers? I can't seem to find them locally anywhere :( Thanks! Oh How wonderful!! This is great Jessica! Wow! I just recently have found your blog and I feel as though I have been missing out! Very inspiring indeed! I have a couple questions if you do not mind. Do you get up at 4am? Just kidding that is not my real question!! 1. Does your family say the rosary daily? 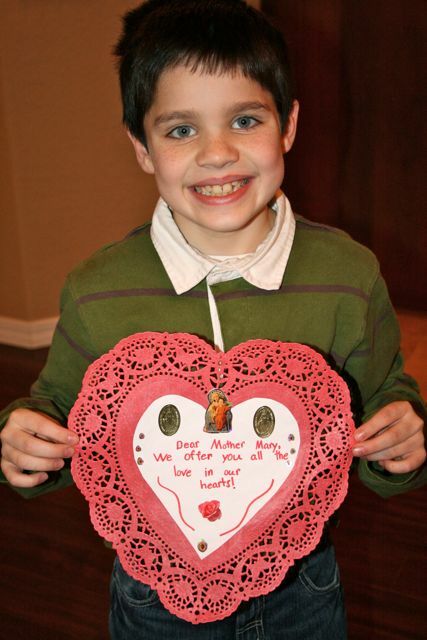 My intention was to say a decade a day with our family, but we are doing well if we get 4 decades a week...sad. 2. With all your crafts do you keep them all? There is so much fruit from looking at them to remember all the learning involved, but at the same time the "clutter" starts to way me down. 3. I am being nosy, but I would love to see a "typical" day schedule you keep for schooling - what your routine is. You must have a great gift of organizaiton and efficiency!! 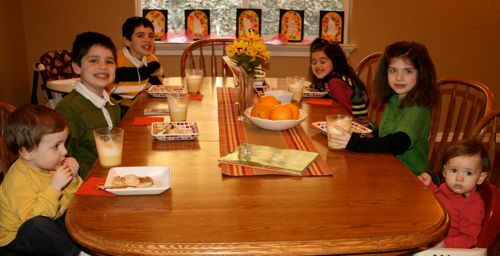 Thanks for sharing your blog, it is truely inspiring for me! What a blessed celebration!! I really need to try that orange smoothy recipe. It sounds delicious! Robina ~ Even I liked the caramelized bananas! I hated bananas as a child, and found out a couple years ago that they are on my "severely intolerant" list. However, I figured since I was going to have some of the coffee ice cream (cow's milk is also on my severely intolerant list) I could at least taste the bananas! lol! Elizabeth ~ Perhaps you can have a Candlemas Tea? We had it last year and really enjoyed it. I hope to serve it again this year. Kelly ~ Oh goodness, I have a box of stickers, from all over the place - mostly purchased online and received as gifts. I will try and compile a few sources and post them soon. Katie ~ No.... I actually go to sleep at 4am! ;) Just kidding, though sometimes it feels like it. I definitely prefer staying up late to getting up early, though it is a habit I am *trying* to change, with very little luck. lol! As for your questions... Let's see. 1. It is our goal to say the rosary every day, though sometimes we do fall out of the habit. (It was very hard this past summer when our home was under construction during our remodel, for example.) Every Lent, May (month of Mary), Oct (month of the rosary), and Advent we resolve to start saying a daily rosary as a family once again. 2. 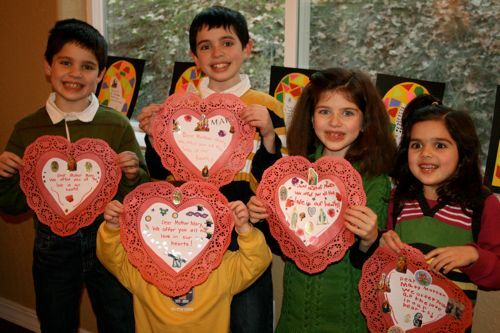 Crafts make great gifts! ;) We do keep our favorites, but for the most part we display them for awhile and then get rid of them. I recently purchased document boxes (after talking to Charlotte @ Waltzing Matilda) for my children to keep their artwork in (they can keep whatever will fit in the box) and so far it seems to be working great. I DO keep all the Lap Books my children make since they are so neat to look back at and since so much effort was put into creating them. 3. I am currently trying to create a new schedule that works for us.... When I have it finished I will be sure to post it here on my blog. In the meantime, here is an old schedule that worked for us at one point. I hope that helps! Thank you for visiting and your kind comments about my blog. God bless!